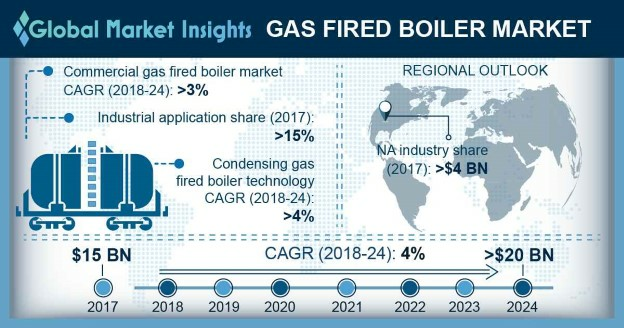 Gas Fired Boiler Market size is anticipated to surpass USD 20 billion by 2024, as reported in the latest study by Global Market Insights, Inc.
Gas fired boiler market is set to witness robust growth on account of growing adoption of energy efficient space and water heating solutions along with ongoing regulatory measures toward the mitigating the greenhouse gas (GHG) emissions. For instance, the EU has set a target to reduce its GHG emissions by a minimum of 40% from 1990 levels by 2030. Ongoing investments toward infrastructure development coupled with favorable government initiatives and policies across developing economies will further boost the industry growth. Ongoing substitution of conventional boilers on account of their inferior operational performance, and growing maintenance costs along with increasing fuel prices and strengthening environment policies will positively influence the gas fired boiler market size. High energy efficiency and lower maintenance cost coupled with easy accessibility of fuel are some of the key factors which will encourage the product adoption. According to the EIA, over 7,700 billion cubic feet of natural gas was consumed by industries in 2016 growing over 2% from previous year. Shifting trends toward processed food consumption and resurgent economic growth across key economies across the globe will propel industrial gas fired boiler market growth. According to United Nations Industrial Development Organization (UNIDO), chemical industries added over USD 400 billion worth of manufacturing value added in 2016. Favorable government initiatives toward the development and expansion of industrial & commercial infrastructures will further complement the industry landscape. High energy efficiency and reduced heating costs along with the product’s ability to offer lower carbon emission are some of the key features that will boost the condensing gas fired boiler market growth. The technology recovers latent heat from steam by condensing the water vapor from exhaust. However, its limitation to work under very low temperatures and high initial cost may hamper the technology adoption. <10 MMBtu/hr natural gas fired boiler market, in 2017, was valued over USD 9 Billion. Ongoing investments toward development of commercial establishments coupled with growing space heating demand from urban centers will enhance the product penetration in forecast timeframe. The gas fired boiler industry will further excel on account of improving accessibility of natural gas for domestic & commercial space heating. Growing service sector coupled with positive outlook toward manufacturing industry in countries including China and India will augment the demand for high capacity natural gas fired boilers across Asia Pacific region. Growing urbanization along with replacement of traditional low-efficiency residential boilers across developed Asian economies will further drive the demand for residential gas fired boilers in the region. Prominent industry participants across the gas fired boiler market include Fulton Boiler Works, Babcock & Wilcox, Hurst Boiler and Welding, Forbes Marshall, AMEC Foster Wheeler, Rentech Boiler, Miura America, Hoval, Fondital, Viessmann, SIME, Groupe Atlantic, Bosch, Weil-McLain, Ferroli, Bradford White Corporation, Burnham Holdings, A.O. Smith, BDR Thermea Group, Parker Boiler, Vaillant and Carrier among the others.